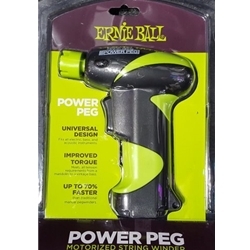 The Ernie Ball PowerPeg motorized peg winder makes restringing your guitar quick and easy! According to Ernie Ball, the compact, battery-powered PowerPeg lets you change strings up to 70% faster than you can with conventional manual peg winders. This handy unit uses a universal peg winder head made to fit practically all guitars and basses. Small enough to fit unobtrusively into your gig bag, this easy-to-use winder is one of those essentials that will make you wonder how you ever got along without it.